Everything you need to know about Business Start Up, Development, & Growth Strategies. Every business starts somewhere and some have more than just one beginning. Now, whether or not it gets off to a good start or can last past the 5-year mark depends on a lot of things. OUR SIDE GIG BASICS gives you the tools to succeed coming out the gate. The NEW FACE of the 21st Century Entrepreneur is all about solid options and creating your own opportunities instead of waiting on them. EATING WELL happens when you THINK BIG and BUILD BIG from the start. The yield to expect is nothing but BIG THINGS as a result. To me, the SIDE GIG ENTREPRENEUR, is the person who is steady grinding and hustling hard to make it in this world. I admire the dedication of those who fall into this category and I guess it is near to my heart because it is the foundation of every Hustle MAMA. Starting a new business is never easy, but, it can be and well worth it when you have someone who is willing to share everything they learned the hard way so you can set it up without the trial and error learning curve. 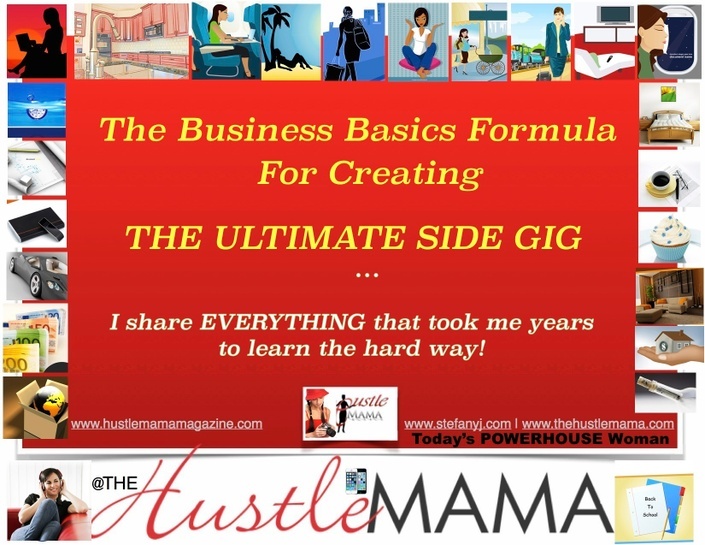 The SIDE GIG TRACK is for anyone who has always wanted to, dreamed of, and desired to do something else in addition to what they are already doing for a living. It is also the perfect track for those who may have had a failed business in the past and they have been too scared to try again. The BUSINESS START-UP BASICS Content is everything you need to create a solid foundation for any start-up business or for re-vamping a business that is facing challenges. Learn how to AVOID THE MISTAKES I MADE that I share with you, and INSTANTLY CUT YOUR LEARNING CURVE. My curriculum SAVES you TIME, MONEY, and also from the HEARTACHES of not knowing if your idea is going to work, or if your business is really going to succeed the way you want it to. I am your TEST RUN and BEST TEST SUBJECT because I have done all of the hard work and research for you! I have successfully built and integrated new business development strategies in the corporate world for multi-million dollar companies for more than 2 decades. No one has time for drawn out webinars, long books to read and tons of content to sift through. Instead we give you the quick fix solutions, lists, tasks, worksheets, and strategies you need to CUT TO THE CHASE and MAKE IT HAPPEN. We take all of the hard work out of the equation and give you THE FORMULA you need to succeed. THE BEST PART of this course is you can recycle all of the information and modify it for almost any and every business venture you endeavor to participate in. It can also be the tool used to flush out whether or not your concept is "big picture" enough in scope to have the type of sustainability you desire. This Course is a MUST TAKE for anyone considering launching a NEW BUSINESS, a BRAND or their ESTABLISHED business to the highest levels possible. Is it Easier to Publish a Children's Book?